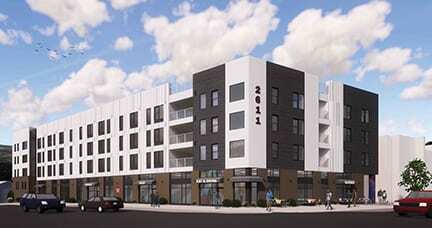 An artist rendering of the four-story building with 63 apartments and retail space on the first floor. NASHVILLE, TN — A non-profit housing agency is doubling down on six acres where they have already built 23 units of affordable apartments with $1.5 million from the Barnes Fund. Phase 1 was completed last year. Phase 2 will be finished in late summer 2019. Phase 3 will be completed by December 2019. 2014 for $680,000. They completed Phase 1 in March 2017. It quickly filled up with new tenants. 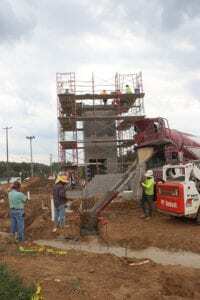 Total construction cost was $3.3 million: $1.5 million from the Barnes Fund, a $1 million Community Investment Tax Credit (CITC) loan from the Truxton Trust, and a $800,000 HOME grant. CITC is a program of the Tennessee Housing Development Agency that helps finance low income housing projects. HOME is a federal grant program for states and local government to assist low income families. It is funded through the U.S. Department of Housing and Urban Development (HUD). “There is a really severe housing shortage in Nashville and this kind of housing is really critical as a resource for the community,” said Kelsey Oesmann, UHS Design Initiative Manager. Workers pour the Phase 2 foundation for 63 low-income apartments on Clarksville Pike that will be finished in the Summer of 2019.
summer 2019. There will be studio, 1-2 bedroom, and a few 3-bedroom apartments. They will be leased to tenants who make up to 80 percent of the Average Median Income (AMI) or up to $48,000. Two units will not be income-restricted which means two tenants can make more than 80 percent of the AMI. The financing for the current $9.2 million project includes $4.5 million from the Barnes Fund, a $3.4 tax credit loan from Renasant Bank, a $200,000 grant from Wells Fargo Bank, and UHS is putting up $1.1 million. 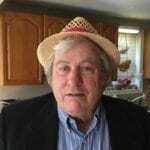 Former Mayor Kar Dean created the Barnes Fund in 2013 to invest in low income housing and leverage federal and private funding to build more low-income housing. To date it has financed more then 1300 units, invested $27 million and leverage more than $127 million. There is still a crying need for 19,000 affordable units and the city will need an estimated 31,000 affordable units by 2025. Phase 2 is a mixed-use project, similar to ones the Metropolitan Development Housing Authority (MDHA) is building to replace old public housing projects. Phase 2 will have a health clinic, probably staffed by Vanderbilt nursing students. Services will be free to residents and low-cost to neighborhood residents. It will also have a café on the first floor. Oesmann said artists live in MDHA’s Ryman Lofts downtown but there is a long waiting list so UHS planners decided to earmark some space in Phase 2 as an “arts incubator”. She described it as “live, work, community gallery-type space” in addition to the ten units set aside for artists. “The creative community here in Nashville feels the squeeze of the rising costs of living just as much as everybody else does,” she said. The property is big enough to build fifty-five 1-2 bedroom apartments for seniors. Fifty-two of those apartments will be voucher-supported units which are like Section 8 vouchers but tied to the property to keep rents affordable for low-income seniors. Those apartments will cost $12.4 million to build with tax-credit funds from Pinnacle Bank and a Low Income Housing Tax Credit (LIHTHC ) loan from HUD. 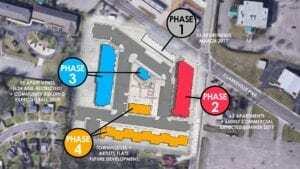 When Phase 3 is completed in late 2019, UHS wants to break ground on Phase 4. It will consist of 27 townhouses and artist flats. Financing for Phase 4 has not been obtained yet. Phase 2 apartments will be managed by UHS. The retail and commercial space will be contracted out to a management company.